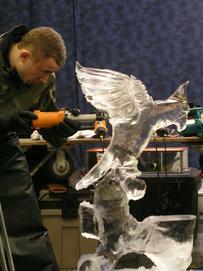 Acquire the latest techniques in competitive ice carving from world champion and master carvers. Learn by doing with one on one training and live demonstrations. 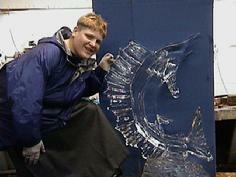 Each student will create 5 ice carvings from over 1000 lbs. of ice. Detailed instruction on: safety, dynamic designing, ice fusion, logo’s in ice, human anatomy, and sculpting 3-D. Classes available for the beginner to the advanced ice carver. Class sizes are 4 students per instructor. Individual one on one training also available the first monday & tuesday of the month. Next class scheduled for April 9th & 10th, 2011, 9:30- 6:30.Class fee $550. Limited availability. please call or e-mail for more info. Ice carving champions are born here! Guaranteed to carve 10 years off of the learning curve!